There are thousands of folk songs in Latvia. These are songs of the sky, sun, earth, ocean, fire, and love，they are for humans. Our ancestors believed in the god of nature, the Creator, and prayed for a good harvest and for children to be in good health. Eight or nine hundreds years ago, it was sung in old folk songs when Latvia was called the earth MARA (woman). The ancestors believed in the goddesses more than the gods. They believed in 65 goddesses such as the goddess of forest, ocean, wind, rain, and earth. 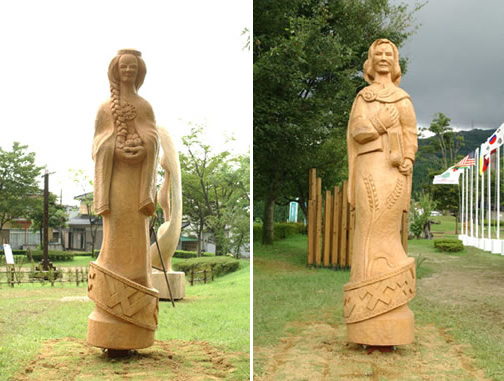 This sculpture TWIN, is the goddess that our ancestors believed in for fortune and as a source of wealth. They believed that without this goddess there would be no life, no children born by men and women or the production of fruit from male and female trees on this earth.